If you have a large group of up to 16 people and don’t want to be on top of each other, you’d love Ultimacy Villa. There are eight bedrooms, three of which are in their own self-contained suites. Your guests can spread out and have fun in the recreation room, gym, pool, and indoor and outdoor living areas. In fact, it’s hard to imagine not having enough space at this lovely villa! Great for family or group vacations! Ultimacy Villa is located in Rose Hill in the Sea Rocks, a residential neighborhood nestled between the villages of Shoal Bay East and Island Harbour. 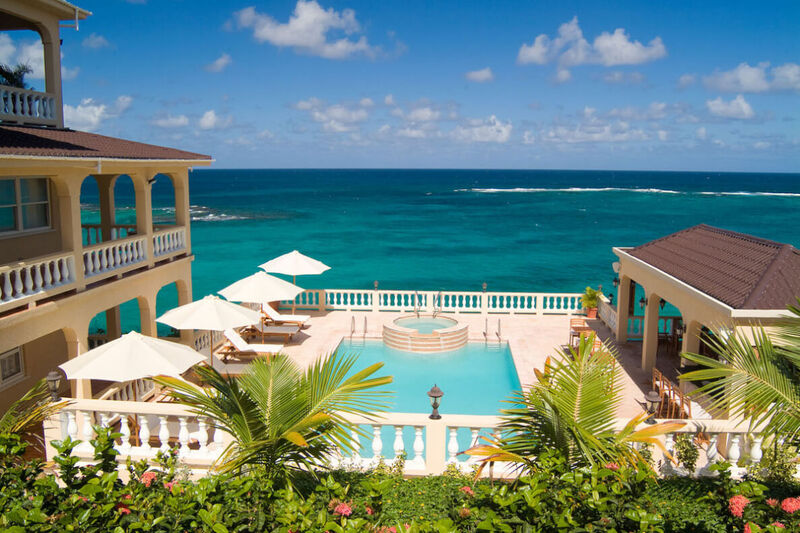 Situated on Anguilla’s northeast shore, this property has breathtaking views and can comfortably accommodate up to 16 guests. Ultimacy offers many secluded spots for quiet conversation, reflection, and meditation while listening to the pulse of the calming surf. A gated entrance and lush gardens welcome guests into the villa’s 5,000 square feet of outdoor living space. A large infinity pool and whirlpool Jacuzzi sit in the center of the deck, and daybeds and umbrellas sit nearby. Off to the side, there’s a covered gazebo featuring lounge furniture, a full wet bar, and outdoor dining. Upstairs, there’s more covered dining with even better ocean views. There are two levels of wraparound balconies at Ultimacy, so everyone can enjoy the sea vista. Dual staircases curve up to the top floor, which holds the main living room. This living room is the focal point of the interior, and it has cathedral ceilings that invite cool, island breezes and tropical views. The main kitchen is located on the western end of the top floor and features a 48” Viking stove, microwave, state-of-the-art appliances, and elegant cabinets. On the ground floor, there’s a spacious recreation room with a traditional paneled wet bar, multiple seating areas, a flat panel plasma TV, and a classic Wurlitzer jukebox. The recreation room also holds the office, which has a computer and high speed Internet connection. Adjacent to the recreation room and across from the office is a fully-equipped gym with a variety of cardio machines, resistance equipment, and cable TV. Two master suites are located off of the main living room on the upper level. Both have air-conditioning, a four-poster king bed, a ceiling fan, an ensuite bathroom, a dressing area, and a walk-in closet. One of the masters opens to the dining balcony. This level also has a queen suite with a private bathroom. On the ground floor, there’s two suites. The king suite has its own lounge, galley kitchen, and private bathroom. It can be accessed through the ground level common area or independently. The other suite has two double beds with an ensuite bathroom. The pool pavilion has three bedrooms total, with two queen suites and one twin suite. One queen suite has a lounge, galley kitchen, and private bathroom. It can be accessed through the common area. The other queen suite has an ensuite bathroom and can only be accessed from the terrace. The twin suite has two beds and an ensuite bathroom, and can be accessed through either the terrace or the queen suite attached to the common area.? Ultimacy Villa is within a five minute drive of Shoal Bay and Island Harbor. Shoal Bay has several water sports, restaurants, and activities to explore, and Island Harbor has a ferry that goes to Scilly Cay. This charming little island off the coast of Anguilla has a well-loved restaurant and bar, and is a favorite for returning travelers. Bedroom 3: Pool Level - Accessed through the pool suite. Bedroom 4: Pool Level - This bedroom can be made independent and accessed through the terrace, or through a connecting door from bedroom 3. Bedroom 5: Ground Level- Can be independent or accessed through the ground level suite. Drive to Shoal Bay Beach in under 10 minutes. Taxi is arranged to meet guests at the port of entry (airport or Blowing Point ferry dock) and are greeted by villa staff upon arrival to give a tour and answer any questions. The taxi is at the guests expense. Welcome Cocktails and canapés, Caribbean continental breakfast, sunset cocktail hour, afternoon sorbets by the pool, rental van with 8 passenger seating, and turn down services. Provisioning prior to your arrival (cost of food separate).